Peter Chermayeff is a boy of 58. His childhood love affair with frogs and tadpoles, minnows and crabs in the bays and ponds of Cape Cod turned, on a July evening in 1990, into an adult epiphany. He swam for an hour in the shadow of a 17-foot whale shark which, even halfgrown, was the largest fish in any aquarium in the world. “It’s her building; she has simply taken full possession,” said Chermayeff, describing the shark’s awesome presence as she moved around the immensity of the 1.5-million-gallon Open Pacific tank, the core of the Ring of Fire Aquarium in Osaka, Japan, which had opened to the public earlier that day. As he swam in the Osaka tank, Chermayeff could see his family on the other side of the foot-thick acrylic walls that held back 5,400 tons of water. Rays shaped like stealth bombers, schools of mackerel and jacks, giant perch, cobias, rainbow runners and many others moved in balletic rounds. The tank’s cruciform shape and the pattern of water supply and return were designed to produce varied currents and eddies so that the whale shark and the schooling fish would parade in figure-eight patterns around their salty domain, moving left, right, left, right. This not only brought them closer to all the spectators surrounding the crystalline walls, but produced a more natural and healthy swim pattern than the one-directional round-and-round of ocean fish in the circular tanks of earlier designs. As a young man just out of the Harvard architecture school, Peter Chermayeff was ambivalent about practicing architecture and thought of becoming a filmmaker. While at Harvard he made a children’s film that is still in distribution. Called Orange & Blue, it features two bouncing balls on a visit to a junkyard filled with such castoffs as railroad cars, Army tanks, printing presses. culverts and bathtubs. He has since made 11 other films, portraits of African wildlife. But in 1962, when he was 25, he heard that a Boston group was planning to build a public aquarium. “I hardly knew what an aquarium was, beyond a fish tank, but I wanted to build this one,” Chermayeff says. “I remembered one powerful experience when I had gone to a Florida oceanarium before it opened, early one morning, and saw down a dark passage a window of water with daylight beyond. A large, living form glided across the window, a dolphin, and I was struck by its mysterious presence and a sense of personal connection. Surely, in a public aquarium in Boston that kind of magic could be offered, something fundamental that large numbers of people might share. It was the very first of a whole new kind of aquarium, with a daylight-excluding, four-story gallery space, and at its heart a three-story cylindrical ocean tank that simulates a coral reef. Ramps and bridges move visitors upward at first to the galleries and then downward in a spiral surrounding the central tank. Peter shaped the model of the first reef himself, out of modeling clay. Constructed at low cost for the opening, it was built of concrete, urethane foam and fiberglass. Several years later a more detailed simulation of coral habitat diversity was designed and fabricated by the aquarium staff. The technologies of big acrylic window walls, extremely lifelike simulations of rocks, coral, seaweeds, trees and other plants, and the ozone water-purification systems of today did not yet exist. But the aquatic museum concept, the urban location, the lighting, the story lines, the graphics, the habitats and, above all, the presentation of the animals, always the stars of the show, were so compelling and innovative that the New England success began a wave of aquarium building that continues to sweep across North America, Europe and Asia. When the New England Aquarium opened in June 1969, privately financed at $6 million by a group of corporations and individuals, the once derelict Boston waterfront was reborn. Central Wharf, the site, was purchased for $1 from the city in 1962 and today has an estimated worth of $50 million or more. The aquarium was projected to attract 600,000 visitors a year, but soon after the opening, attendance reached 1 million and has stabilized during recent years at around 1.3 million. The aquarium sits within walking distance of the shops and restaurants of the enormously successful Faneuil Hall Marketplace, James Rouse’s flagship of urban renewal. An aquarium built as a centerpiece attraction, and near such a marketplace–as was soon repeated in Baltimore–has become part of waterfront planning for cities as far away as Osaka. Cambridge Seven’s offices are in a rooftop space on Massachusetts Avenue overlooking the spires of Harvard. At full strength, 50 architects, exhibit designers, model makers and assistants fill the modules of a lofty studio, daylighted from a huge north-facing wall of glass. The lobby and corridors contain a miniature amusement park: models of aquariums and similar projects. One, for example, is a child’s fantasy of a model for an Amazon rain forest, showing 120-foot trees to be placed under a climate-controlled greenhouse structure, with glass elevators to carry visitors to the forest canopy and treetop walkways. Peering past the fig trees, tupelos and lianas, one sees tiny parrots, macaws, sloths and monkeys, and on the jungle floor, egrets, ibis, caimans, capybaras, tapirs and ocelots. Streams and pools are filled with Amazon fish. The rain forest project is only a concept at this point, yet to be built. “I’m hoping to build it in Japan,” says Peter Chermayeff. And he would be very proud to do a similar one in Russia, the land from which his father emigrated before the 1917 revolution. Model making is a part of the design process in many an architect’s office, but here it is not only a fine art but a unique necessity. The projects are too three-dimensional to understand through drawings alone. Models contribute to the dialogue between the design team and clients who must visualize buildings different from any they have ever experienced. Chermayeff and his colleagues travel the world with specially made cases and crates that nest the models like the precious creations they are, reassembling them for presentations that help raise the extraordinary amounts of money it takes to build anything so complicated. A model of the entire Osaka project-the aquarium, marketplace and plaza, exquisitely detailed, with toy boats in the harbor and banners flying above the shops and restaurants–is displayed in an acrylic case in the Cambridge Seven entrance foyer. This model, and others now in Japan, played an important role in the success of the $216 million project, the most ambitious completed example of Cambridge Seven’s work. Cambridge Seven was asked to meet a crushingly short deadline-less than three years from conception to opening day, and the location was halfway around the world. Back in Cambridge, Chermayeff, Zaremba and others began to flesh out possibilities for exhibit content, the starting point. In a week they had a thematic image, the “Ring of Fire,” a phrase often used to describe the tectonic and volcanic activity that surrounds the Pacific Basin. The aquarium would celebrate this Ring of Fire as a “Ring of Life,” circling through eight distinct areas at the edge of the ocean, beginning with Japan, moving up and across the Pacific to the Aleutians, down to Monterey Bay, the Gulf of Panama, Ecuador and Chile, Antarctica, New Zealand and back around to the Great Barrier Reef. The first model was made of Lucite blocks, transparent to help the team imagine looking across a central tank filled with an enormous amount of water to other tanks on the far side. “Peter Chermayeff wanted spectators to enter the world of the fish, to be completely surrounded by water as they moved around the Pacific, to have a sense of being completely submerged and to look through layers of water realms in the foreground to ones beyond,” says Sollogub. While Sollogub’s group was working on the interior composition, public circulation, views through water layers, and the exterior shape, a second team, coordinated by Frank Zaremba, was at work defining the exhibit habitats and the life that would inhabit them, from rocky coasts to coral reefs, from otters and penguins to giant crabs, rays and sharks. A third team, led by Bobby Poole, an architect and partner, addressed life-support systems, husbandry and mechanical systems, consulting with curators, biologists and many engineers. It was, from start to finish, a “charrette,” the architecture student’s term for frantic round-the-clock design work, derived from the way candidates for degrees at the Ecole des Beaux-Arts in Paris were compelled to finish their end-of-term projects. Three months after the work began, a group of Japanese planners led by Keisuke Morita came to Cambridge. And overnight they gave the scheme the go-ahead. An early Japanese plan had located the aquarium at the entrance to the waterfront development on an inland part of the site, with a marketplace at the water’s edge overlooking the sunsets. But Peter Chermayeff felt strongly that the landmark statement of the aquarium building should be harborside, a beacon by the water, and the marketplace should be an open design, a sort of filter one walked through and looked through on the way to and from the aquarium. The Ring of Fire Aquarium towers eight stories high and is topped by four glass pyramids. It contains 286,000 square feet of floor space and 16,000 animals, and cost $130 million, with another $56 million for the marketplace and $30 million for the raised plaza with a garage below. The entire waterfront project was funded by a consortium of the City of Osaka and 27 Japanese companies. It was their expectation to amortize the investment over a 10- to 15-year span, but with more than four million visitors a year since the July 1990 opening, and substantial retail sales and restaurant returns, the prospect is that it will be paid off very soon. All of the Cambridge Seven projects involve a variety of experts. Bill Flynn, former president of the Tennessee Aquarium in Chattanooga, supervised the acquisition of marine life on the American side of the Pacific. An Australian sound-recording engineer, Les Gilbert, flew all around the Pacific Rim to record birds and other wildlife for the soundscapes that have become a part of all Cambridge Seven aquarium environments. James Wertheimer and others of the Larson Company of Tucson, Arizona, designed and fabricated geologically accurate artificial rockwork for each habitat, as well as trees and other plants, and 1,200 pieces of coral simulating the Great Barrier Reef. “Total immersion is the watchword in today’s aquariums,” says Steve Kesler of Reynolds Polymer, which has become the largest maker of acrylic walls. Osaka contains more than $7 million worth of acrylic, half of it by Reynolds, the rest by the Japanese firms Mitsubishi and Sumitomo. “Even the largest panels, the ones that surround the central Pacific tank and are 12 inches thick, have virtually the same optical characteristic as crystal,” says Kesler. “Sodium glass would have a green tint. The refracting surface of the acrylic is so fine that even when there’s a smudge of algae or a wayward mollusk on the inside wall, you can’t see the thickness.” Today, Reynolds has the capability to cast a monolithic piece 27 feet long, 10 feet high and 14 inches thick. Six-year-olds aren’t the only ones who act like moths. Chattanoogan Les Kirk is beside himself one day as he watches trout behavior in a tank at the Tennessee Aquarium. At the top of the $45 million structure, the world’s first major freshwater aquarium, a waterfall tumbles into a sink, a deep pool carved by falling water. Here, behind acrylic windows, brook and brown and rainbow trout gather in upstream-facing phalanxes in the shelter of eddies formed by rocks, periodically moving out into the current, searching for the food the stream brings their way. Kirk, active in Trout Unlimited, runs the Choo Choo Fly Fishing Shop. He had taken Peter Chermayeff and Peter’s son, Nicholas, on a three-day fishing excursion into a Great Smokies wilderness area in the spring of 1988, when Peter was planning the aquarium. The splendid reality of the rock cliff and waterfall, the sink, flowing stream and the entire oozing, trickling foggy habitat is the result. Kirk, face-to-face with his quarry, can’t resist going through the motions of casting as he describes just where to lay a fly. A one-person-wide escalator transports visitors up to the very top of the Chattanooga aquarium. On the way up, there is the cheerful sound of a burbling mountain stream. Overhead videos of the stream swirl as the sound evolves into an East Tennessee mountaineer’s fiddle. At the top, a balcony with glass walls overlooks the river below and the green hills beyond, and then a path leads between limestone cliffs into the Appalachian Cove Forest exhibit. Quail scratch in the loamy soil, and the call of “bobwhite” is in the misty air. Live ferns and mosses, violets and trillium, dogwood and laurel grow beneath towering replicas, real as life, of primordial tulip trees. Hidden in the trunks of these trees are climate-control ducts and mist pipes. A waterfall cascades into a mountain stream. Two frisky river otters dive and play in their mountain pond. The limestone escarpment is a mix of molded fiberglass and concrete, but moss still grows on its surfaces. Upper-level panes at the sides of the pyramid are open to let in the day and its climate, year-round. To make certain that deciduous trees drop their leaves, pipes in the ground cool their roots. Ramps descend through the central canyon that divides the structure down the middle, taking visitors from the height of the Smokies to descending streams, lakes and rivers, all the way to the bayous of the Gulf of Mexico. Another cinematic experience follows. The central core of the Baltimore building is a spectacular oval tank (to reopen soon, after a major renovation) containing the denizens of an Atlantic coral reef and the open ocean. The top section of this chamber is surrounded by a railing that evokes the deck of a ship somewhere at sea, with the moon rising on one side, the sun setting on the other, as rows of clouds kiss the horizon. Darkened ramps descend inside the giant oval with light shining through the water behind windows on all sides. 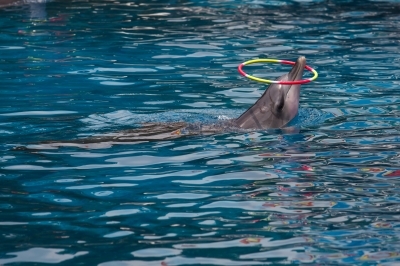 Dr. Joseph Geraci, professor of wildlife pathology at the University of Guelph, Ontario, is a consultant to both the Boston and Baltimore aquariums and has long advised Peter Chermayeff and his group on designing habitats for marine mammals. He says, “The public has no idea how much has to go into the making of a display to place the animals moving in front of them in a comfortable environment.” The animals should be able to behave naturally and, in as many cases as possible, to breed. Temperature, habitat furnishings, daily changes in activity, feeding and light must be carefully planned lest the animals suffer debilitating boredom. The life force of all aquariums is the water. No matter how they may look, these rivers, lakes, streams, oceans and ponds that contain the complexity and variety of life one finds in today’s aquariums do not cleanse as they flow–as they do in nature with the aid of living plant life and sunlight to sweep away the nitrates of biological excretions. Aquarists are continually recommending adjustments to the engineers who run the pumps and computers that operate the life-support systems, almost as complex as any at NASA. When it all works the results are wonderful. Touring the New England Aquarium with Peter Chermayeff, one sees that the boyish enthusiasm for this aspect of the life of the aquarium designer has never waned. He is delighted when Scott Dowd, a young aquarist, tells him that the fish in the flooded Amazon forest tank are now breeding. During high-water season in the Amazon, such fish forage around trees, roots and plants, eating nuts and fruits, seeds, grasses and insects like voracious rodents. Dowd has collected many of the specimens himself on annual tours to Brazil. “I lower the water-exchange level and turn up the temperature and lengthen the daylight in what would be the dry season, and turn on showers and feed them strawberries and grapes in what would be the rainy flood season. They have begun spawning.” For aquarists, one criterion of a successful environment is that the species reproduce. The business is growing. With its network of marine biology and management experts, Cambridge Seven has frequently served as an adviser on start-ups, while it designed the physical plant. When the firm received a commission to design an aquarium within the old port of Genoa, Peter Chermayeff decided it was time to make advisory services a formal part of the business, so he started a new company called International Design for the Environment, Associates, or IDEA. The Acquario di Genova was conceived as the Italian pavilion for Expo ’92, a fair to celebrate the 500th anniversary of the voyage to the Americas of Genoa’s most celebrated citizen, Christopher Columbus. To make the May 1992 deadline, the aquarium had to open prematurely, with only 6 of 30 major exhibits completed. In the late fall of 1992 IDEA withdrew. Subsequently, there have been accusations of embezzlement. Of an announced 1.8 million admissions, money for only 800,000 was accounted for. The mayor has since been implicated and has resigned. While Genoa sits unfinished, other projects are moving ahead. IDEA and Cambridge Seven will build and manage the opening of a $64 million aquarium to be the centerpiece of Expo ’98, Lisbon’s world’s fair, which will celebrate the oceans of the world and Vasco da Gama’s arrival in India. The design concept, that the planet can be perceived as one world ocean, has been developed with four coastal biomes at the corners of a huge tank, all visually connected but also physically separated by acrylic. The roof will be suspended from masts by cables. Chermayeff describes the building as “both a man-made island in the sea … and a ship at rest, ready to set sail.” IDEA is also hard at work on plans for aquariums in Germany, England and Colorado. Closer to completion is a new center for the care of marine life in Seward, Alaska. Cambridge Seven is now codesigning the Alaska Sea Life Center, which will be much more than an aquarium. Construction will soon begin on a $46 million research and rehabilitation facility set in the heart of one of the richest marine ecosystems on Earth. Funded in part from a multimillion-dollar reparations payment for the Exxon Valdez oil spill, it will offer scientists a chance to study natural conditions in the Gulf of Alaska region and disturbances of all kinds, natural and man-made.